In his time, he has served as the Archangel of Justice and sat as Wisdom on the Angiris Council. Once an Archangel, he is now a mortal being, with the limitations of mortality — yet with those limits comes the freedom to act on the mortal plane in a way that the Angels of the Angiris Council are forbidden. Perhaps humanity’s greatest advocate, it was he who saw and understood the potential inherent to humankind, and it was his vote that ultimately spared Sanctuary from destruction at the end of the Sin War. 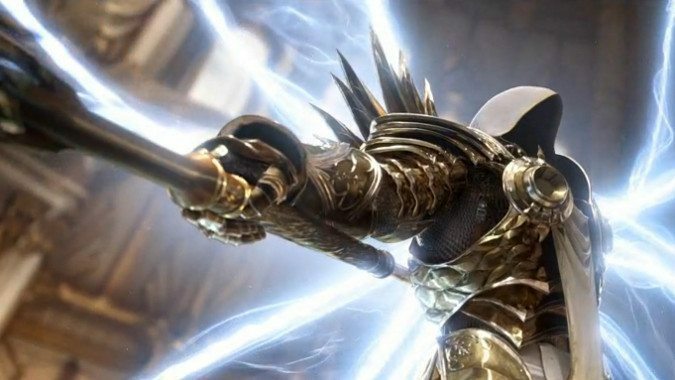 He is Tyrael. Angel no longer, but not truly human either. His history has made history, as well as changed it. It’s vanity to say we know how Tyrael came to be. We know that as an Angel, he was birthed from the cosmic vibrations of the Crystal Arch that dominates the High Heavens. We know that in the time before the Sin War, he participated in the Eternal Conflict between Heaven and Hell. 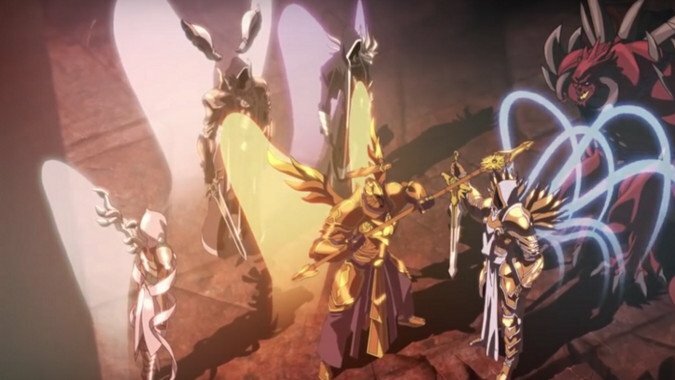 During this time, he and the other Angels of the Angiris Council took the Prime Evil Diablo captive, only for Imperius, the Archangel of Valor, to strike the fiend down rather than allowing them to imprison him. Unfortunately, by doing this, Imperius effectively freed Diablo, since he would inevitably reform. This may have been the first real discord between the Archangels, and it sowed the seed for future disagreements. Despite this, Tyrael and the other Archangels still worked together as a cohesive group to continue the war against the Prime and Lesser Evils and attempt to gain control over the Pandaemonium Fortress and the Eye of Anu within. At this time, he was served by Izual, a close friend among the Angels who was his right hand, and who would help him in the development of a plan much later. He was also close friends with Imperius (despite Valor’s legendary temper) and Inarius. It was by Tyrael’s decree that the Pandaemonium Fortress was constructed to contain the Eye of Anu, also known as the Worldstone. Yet even Tyrael was caught off guard when Inarius disappeared. The Archangel of Justice knew nothing of his friend’s plans, nor the lengths to which he’d go to achieve his aim. Like the rest of the Heavenly Host Tyrael was shocked to one day discover that the Eye of Anu, the object both Angel and Demon had fought over, had vanished. With it the reason for their conflict also was no more — why battle over an empty fortress to possess where the greatest power in the cosmos once was? Both sides sought the Eye in order to use its power to defeat the other forever. Without it, the war ground to a halt, since there was no purpose in continuing it without any ultimate victory available. In time, however, the Angels would discover the truth of what had happened to it. And Tyrael would be forced to make a fateful decision. 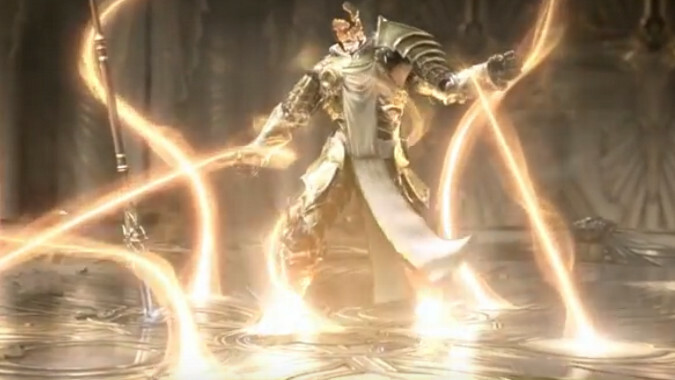 Tyrael was the first of the Angiris Council who discovered the truth of Inarius’ disappearance. The Angel had forsaken his kin and the Eternal Conflict, along with other Angels he’d convinced to join him, and made common cause with demons led by Lilith, the daughter of Mephisto. At first, he sought to judge his ‘brother’ and his creation, the world of Sanctuary, with subtlety for fear of allowing the Burning Hells to seize control of this new plane of existence by force. He also sought to use one of Uldyssian ul-Diomed’s friends, Achillos, to kill Uldyssian and other Nephalem that he saw as threats, only to be surprised at the strength of will that Achillos displayed in refusing his commands. Gradually, Tyrael went from believing Sanctuary a threat to the Heavens that must be destroyed to accepting that there might be potential worth exploring in the humans created from Inarius and Lilith’s co-mingling of the angelic and demonic. In the end, Uldyssian sacrificed himself to defeat Inarius and prevent the destruction of Sanctuary by the runaway power of the Worldstone, and this act would have repercussions — for it was in witnessing Uldyssian’s self-sacrifice that Tyrael changed his view of humanity. When the Angiris Council voted, Imperius voted to destroy Sanctuary and the humans. Malthael, then the Archangel of Wisdom, abstained. Both Auriel, the Archangel of Hope, and Itherael, the Archangel of Fate, voted to spare Sanctuary. Imperius expected that Tyrael would vote with him, and the tie would be sufficient to bring about the destruction of Inarius’ creation, but Tyrael instead voted to spare the humans, to witness what they would grow into. It was the only just reaction to Uldyssian’s sacrifice. The Angiris Council came to an accord with the Prime Evils, Mephisto serving as their representative. They agreed to stay out of Sanctuary, a pact the Evils almost immediately started breaking. And so Tyrael, who had once viewed mankind as an abomination to be destroyed, began to intercede on its behalf. It was Tyrael who, upon learning of the rebellion in Hell that exiled the Prime Evils to Sanctuary (and suspecting it of being a trick) who founded the Horadrim and taught them the secrets of the Soulstones that they would use to bind the Evils. 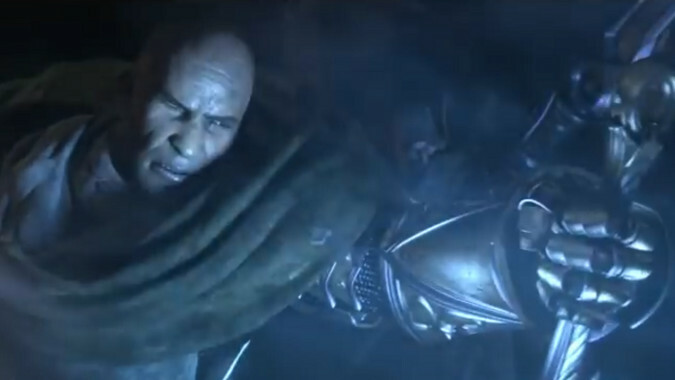 Sadly, Tyrael’s lieutenant Izual had been captured and tormented by the Prime Evils long before and had vouchsafed to them how to corrupt the Soulstones. Therefore, when the Horadrim captured the three, their prisons would not hold them indefinitely. It was through this knowledge that Tal Rasha, the Horadrim mage, used his own body to imprison Baal when the Soulstone was destroyed attempting to capture the demon. And so, when Diablo possessed the body of Aidan, son of King Leoric, and went forth as the Dark Wanderer to free Baal and Mephisto, Tyrael manifested in Sanctuary physically and interfered. He went so far as to do battle with Diablo as the Dark Wanderer, although thanks to the aid of Marius the Prime Evil was able to free Baal and Mephisto. Tyrael, aided by mortal heroes, ultimately chose to destroy the Worldstone rather than allow Baal to corrupt it, and through it the entire world of Sanctuary. 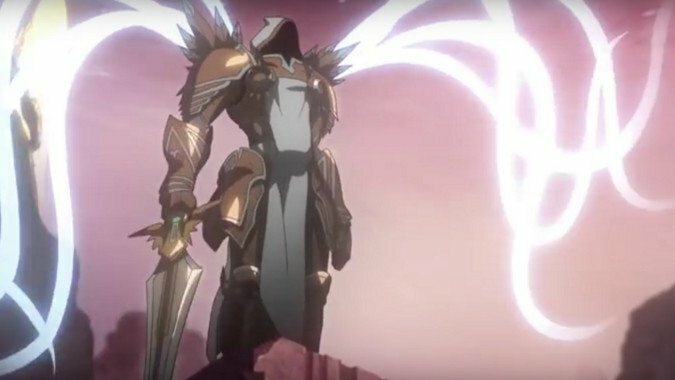 Tyrael’s return to Heaven after this act led him to contest with his ‘old friend’ Imperius. Imperius accused Tyrael of violating the ancient law of the High Heavens, but Tyrael replied that he brought justice. What followed was a conflict that had been inevitable from the moment Imperius struck down Diablo countless mortal lifetimes ago. Thus ended Tyrael’s existence as an Archangel. He fell to Sanctuary as a fallen star, and his presence ultimately led to the discovery of the Nephalem, after his shattered sword El’druin was found and restored. Though the rise of Diablo as Prime Evil wasn’t stopped, that creature’s ultimate victory was foiled due to Tyrael’s actions. As a mortal, he was not affected by Diablo’s attack on the Crystal Arch and therefore could aid the Nephalm in reaching the Prime Evil. For this, Tyrael was asked to rejoin the Angiris Council. He accepted, choosing to fill the seat of Wisdom, left abandoned when Malthael disappeared from Heaven. But the presence of the Black Soulstone in the High Heavens was inherently corrupting, and in time, Tyrael chose to remove it. This led to conflict with Malthael, who had spent his time away from Heaven brooding on the loss of the Worldstone. Malthael came to view humanity as inherently corrupt due to its demonic heritage, and sought to use the Black Soulstone to destroy all mankind. Tyrael and his Horadrim agents found the Nephalem, and in time Malthael was again defeated. Today Tyrael stands with a foot in Heaven and another in Sanctuary. He is the recognized aspect of Wisdom, yet he acted on his own to remove the Black Soulstone from Heaven, trusting his Horadrim to act. A mortal, he is not a human, and does not possess their demonic heritage or the potential power it grants the Nephalem. The former Archangel of Justice has seen the potential in humanity and the Nephalem, but he has also seen the potential danger — for in time, the Nephalem may be tempted to use that power as Uldyssian was, to become akin to a God, and may not resist as Uldyssian did. What the future holds for the one who chose to fall, we don’t know.